In India, digital economy is poised to reach USD 1 trillion in the next 5-7 years and new technologies like IoT, machine learning, artificial intelligence, cyber security etc will play important role in the growth. Recently, Titan Company Limited, the Indian luxury goods company that is part of the Tata Group, has invested $3-5 million in wearable tech internet of things (IoT) startup CoveIoT. There are over 971 startups of IoT in India and Bangalore-the hotbed for IoT holds 51% of total IoT startups. Goldstein Research analyst forecast the India IoT Market size is set to reach USD 20 billion by 2024, at a CAGR of 17.1% over the forecast years. The report covers the present ground scenario and the future growth prospects of the Internet of Things (IoT) Market for 2016-2024 along with the statistics of IoT devices, number of startups and adoption rate of IoT in various verticals. We calculated the market size and revenue share on the basis of revenue generated from major players and investments in various sectors (transport, smart city, services, platforms, logistics, industrial, healthcare, agri tech) across the globe. On the basis of verticals, construction holds the largest share in India IoT market i.e. 15% owing to the implementation government initiaves such as Digital India, Smart City etc. and penetration of connected devices and services. Healthcare and Agriculture sectors tend to grow at the highest CAGR over the forecast period due to the high investment and reimbursement policies. 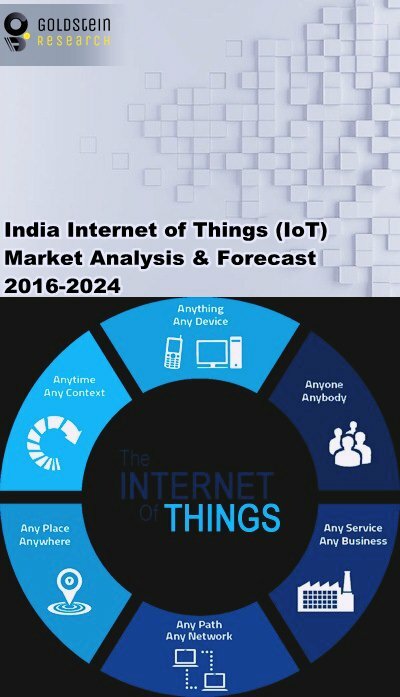 India IoT Market Outlook 2016-2024, has been prepared based on an in-depth market analysis from industry experts. The report covers the competitive landscape and current position of major players in the India IoT market. The report also includes porter’s five force model, SWOT analysis, company profiling, business strategies of market players and their business models. India IoT market report also recognizes value chain analysis to understand the cost differentiation to provide competitive advantage to the existing and new entry players. Our India IoT market report comprises of the following companies as the key players in the India IoT market: Intel, Microsoft, Cisco, Google, IBM, Samsung, Apple, SAP, Gartner, Oracle, General Electric, ARM, Accenture, Amazon, HP, Arduino, IDC, Blackberry, PTC, Verizon. India IoT based startups comprises of the following companies: MangoMan Consumer Electronics, Sensara, Lycos Internet, Altiux, Altizon Systems, Cooey, EcoAxis, Entrib, SPAN, Maven System, Nexiot, SenseGiz, Yuktix. According to the report, major driving factor for India IoT market is the advent of blockchain technology responsible to enhance security, enabling inclusion of low-value devices to be increasingly viable and simplify device management. Further, the report states that the major challenge are compatibility issues originated from non-unified cloud services, lack of standardized M2M protocols and diversities in firmware and operating systems among IoT devices. Few of these technologies will eventually become obsolete in the next few years, effectively rendering the devices implementing them useless. Based on geography, Tier I cities hold the largest market share of India IoT Market owing to the increasing number of startups and expanding ecosystem where sensors, devices, and equipment are connected to a network while Tier II and III hold the growth potential for IoT in India due to the vast opportunities in agriculture and healthcare sector. What is adoption rate (%) of IoT in various verticals? What is the revenue of India IoT in 2015-16 and what would be the expected demand over the forecast period?